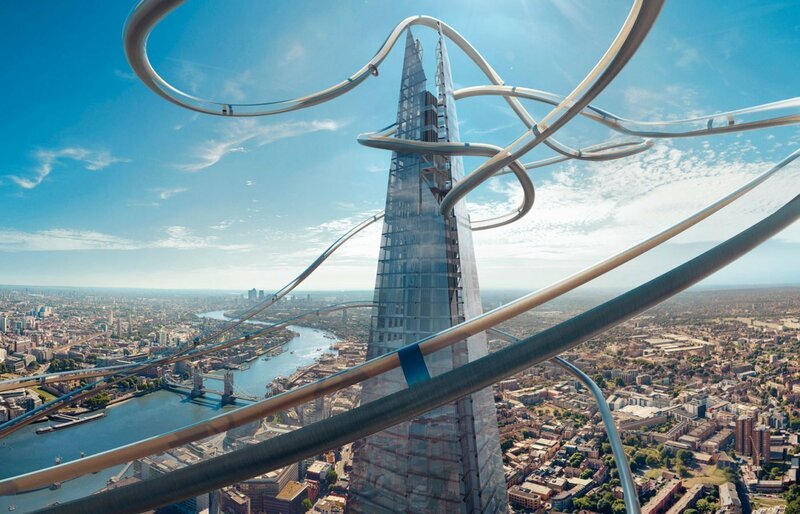 We created a world-first VR Slide experience for The View from The Shard in London. Towering over London at 95 stories tall, The Shard has redefined the London skyline since its opening in 2012. The View from The Shard is the open-air viewing platform on the 72nd floor from which visitors can experience panoramic views of London. Eager to integrate virtual reality into the attraction, The View from The Shard turned to us to help them make a thrilling addition to the observation deck. With an impressive skyline and an 800ft drop at our disposal, we came up with ‘The Slide’, a unique VR experience that takes users on a rollercoaster-meets-helta-skelta slide around the iconic London landmark. So how did we go about this? We stuck drones out the top of The Shard (as you do) to take four 360° images at each corner of the sky-deck. One of our artists also built (in CG) a transparent glass slide and a replica of the Shard. Our developers then took it one step further by introducing a custom-built motion platform that could replicate speeds of up to 200mph and tested 20° tilts and 60° movements. We then put all of this together to create a thrilling photo-real VR slide experience. The result...people loved it, hated it and shared it everywhere.